This item has been discontinued and is no longer available. For superior latex free hold, we recommend Revlon Precision Lash Adhesive and DUO Brush On Striplash Adhesive (0.18oz). 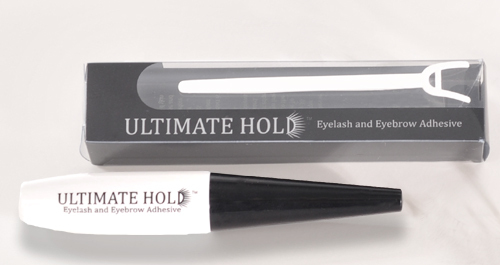 Ultimate Hold Adhesive (also known as Eyelash and Eyebrow adhesive) is formulated for LONG lasting staying power. Your falsies will stay on securely all day. Adhesive comes with its own unique bottle with a brush for easy application. This formulation is LATEX FREE, PERFECT for latex sensitive individuals. Shipping Restrictions: This adhesive is temperature sensitive and will congeal (solidify) if exposed to temperature less than 30°F. Please do not order if your location is colder than 30°F. Similar Product: DUO Eyelash Adhesive (latex based), Revlon Precision Lash Adhesive, and DUO Brush On Striplash Adhesive (0.18oz). I am everyday-user of strip lashes. Until now I used 3 sorts of latex free glue. The hold of this particuler one is the best so far, but unfortunately, comparing to a latex glue, has very weak hold. If you want to keep your lashes whole day, you have to keep the glue in your pocket, because you have to glue it more times. And its not easy removebale from lashes. Let's start with the bad news. This glue has two weaknesses. First, the packaging. The glue crystallized on the very first use. Another plastic tube/soft brush, which is better than no brush, yet not as good as a hard applicator in my lash book. Hard glue on the first use has me agreeing with a previous reviewer who said something like, "we lose product with this one." Yes, we definitely do! We just don't know how much. As mentioned by another reviewer, there isn't a size (or an ingredient list) to be found. The second weakness of this adhesive is the inability to easily remove it from lashes one plans to reuse. This seems to be indicative of all the latex-free adhesives I've tried. On the plus side, the hold is absolutely excellent! Like concrete. Even inner corners stay put. The adhesive, which purports to be all natural, dries completely clear and feels airy and light. It dries faster than latex glue, yet not so fast you don't have time to finesse. Definitely the cream of the latex-free crop! I LOVE this stuff. By far the best. Tacky straight away and keeps lashes in place for ages!! Even days. Great how it is clear always and you only need a tiny bit. How many mls it has! But still :) 9/10 stars I truly am in love with this glue. 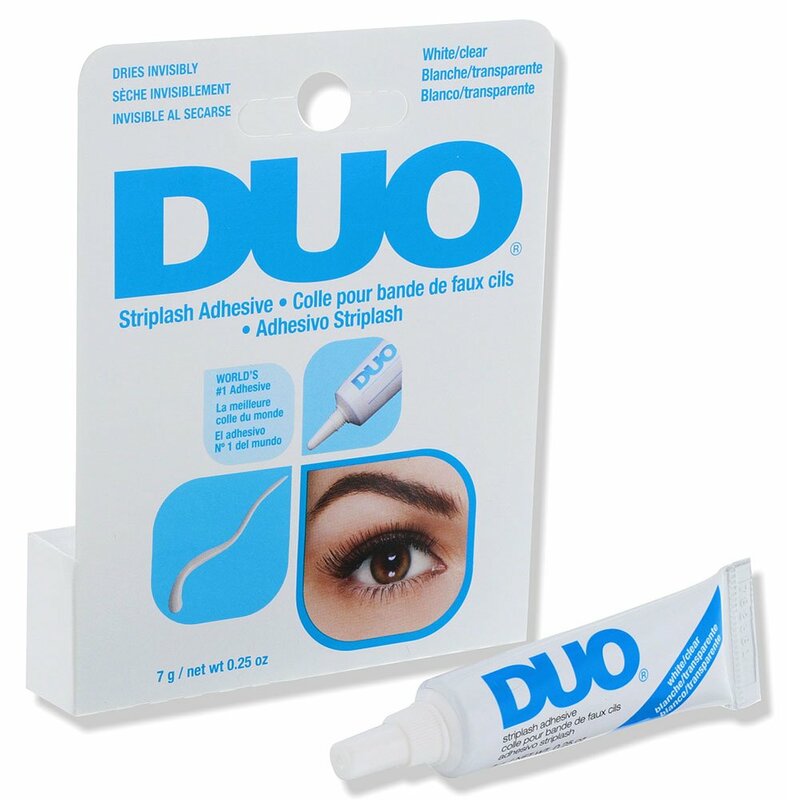 The original adhesive was great, my eyes are very sensitive and this was the only adhesive I did not have a bad reaction to. Since the formula has changed I have developed and allergic reaction to this product. Does anyone know of any product similar to the original? Cons: Glue clumps around the tip of the tube and the brush itself. Wish the packaging was different. Glue is harder to take off...oil-based makeup remover will do fine. Pros: I have really REALLY watery eyes and this glue helps my lashes stay on all day. A little goes a long way. Dries quick and clear. definitely the best hold ever, the only bad side is that i feel it runs out quick and can sometimes harden but definitely the best eyelash glue out there and i wear lashes daily and have tried mannnnnnnnny brands! I use it for false eyelash strips. With the newer version, I'm having allergic reaction. Otherwise, I highly recommend this product! The BEST ! Lashes stay for days !!! This stuff is truly spectacular. Not only is it super tacky immediately, it is truly WATERPROOF & lasts for days. It is tacky enough to stick in place, but stays moist long enough to remove & replace for that perfect fit. Product is packaged in a tube, with a small brush attached to the top (similar to liquid eyeliner)for incredibly fast & accurate application. This truly has cut my morning lash ritual time in half. It is strong & waterproof enough to sleep in and to wash your face without your lashes budging. This glue has GREAT STAYING POWER! No need to wait for it to become tacky. I use it for lashes but also to put jewels around my eyes. This stuff is GREAT! The only reason I didn't give it a perfect score is because after only one use, it starts to clump up on the applicator brush =(, so I may be out $5. But the intitial use was A DREAM COME TRUE!!! I was using the Duo dark. I was skeptical but gave this a try. So far I really like it! Seems to hold better, dries clear, easy to apply. It does seem a little harder to get it off your lashes once you take them off!